Nearly two weeks after the car bomb in Gaziantep, locals share mixed views of the “city of peace” and tolerance. The shattered pavement, local shop owners say, was repaired the day after a car bomb exploded on Koruturk Street in central Gaziantep on August 20th, leaving 10 dead and nearly 70 wounded. But not everything could be fixed so quickly: some windows are still broken and a few buildings are still being restored. “The bomb,” said Imran Akar, “brought us closer together.” Akar, a Kurd from the southeast province of Siirt, works in a flower shop on Koruturk Street with his colleague Bayran Kanbur, a Turk. As they prepared a yellow flower bouquet, the two said that they feel no animosity toward each other because of the bombing. “Many different groups live in this city. We go to the same mosques, we live in the same neighbourhoods, we greet each other on the street. We are all religious and religion forbids discrimination,” Akar told SES Türkiye. 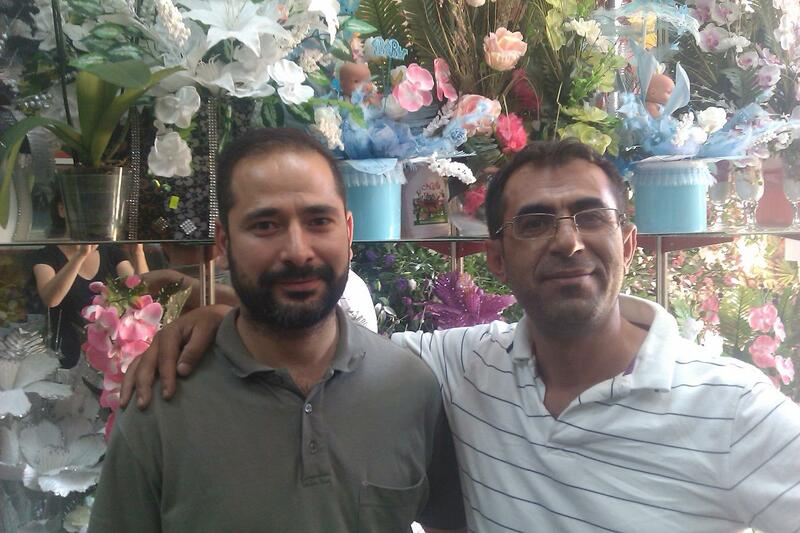 Imran Akar (white shirt) and Bayran Kanbur in the flower shop. While Akar and Kanbur refrain from discussing what could tear them apart, in a street located around the corner from the provincial BDP office that was torched after the bombing by a mob of Turkish nationalists, a group of neighbours speak in Kurdish. Among them is Sabiha, 52, whose brother is in jail. “He was caught with seven explosives in his car,” Sabiha said, refusing to give her last name and preferring to talk inside her home. “The neighbours shouldn’t hear me. We are all Kurds here, but some of them are assimilated and I’m not sure if I can trust them,” she said inside her home. Her brother was sentenced to a long prison sentence six years ago, she said. Gaziantep is referred to as a tolerant city, or even a “city of peace,” because it has never been confronted with terrorist attacks before. But it is not only that explains Orhan Kemal Cengiz, a lawyer and human rights activist. “In Gaziantep several groups live together. But there is no serious tension between the groups like you see in other cities where the Kurdish population has grown due to immigration, like in Mersin or Izmir. In those cities, you have not only Kurdish immigrants, but also many nationalist Turks, and it can be explosive if these two come together,” Cengiz told SES Türkiye. “The people behind the bomb, whoever they were, want direct confrontations between Kurds and Turks. Luckily that didn’t happen in Gaziantep. The city kept its calm,” Cengiz added. In Gaziantep, the nationalist MHP is not among the biggest parties, neither is the other end of the political spectrum, the pro-Kurdish BDP. Many Kurds vote for the AKP, or CHP if they are Alevi. In your article you setup everything around the comments/thoughts of two persons. I don’t know if they are people who is specialized in this issue. If they are not I guess anyone else’s comments here should have more or less the same value. Right ? I’m from Izmir and one of my best friends is from Antep also I have another one from Urfa… They have quite established families there and they have Turk origin (if it is easy to track that). First thing first : You just overlook (or don’t want to write about it or don’t know about it) the fact that Antep is relatively a rich city that’s why people live together without problems. That supports also the argument “Kurdish issue is not an ethnic issue rather an economical issue”. Ethnical part is forced by media members like yourself or some countries all around the world. Also that’s why neither BDP nor MHP is powerful in Gaziantep. I don’t know Mersin but I know Izmir very well. People of Izmir is generally Patriotic (do you remember this demagogy ?) and mostly they are fanatic about Izmir and its values. Izmir is a modern city with a certain liberal lifestyle and all the clash is happening because some people who immigrated to Izmir from some other cities (not necessarily Kurdish people it can be anybody from any conservative city) is having difficulties to fit to that life style. For instance in Izmir if some guy bothers a girl who is wearing miniskirt, generally other people react to that and this reaction may not be so easy to deal for a guy who is coming from the east of Turkey. Hope you get the picture. I don’t think I need to give many examples. So, I disagree with Cengiz. Why ? I disagree! But that’s ok since it is someone’s opinion. Probably Mr. Yılmaz is not a historian or sociologist or an expert in the issue. So I have lots of sympathy for his thoughts. What is weird here you just take two people where you can use their sentences to shape truth in a strange way to misinform your readers. I wonder how ethical is this ? But since you censor my comments (which does not include any insult or anything other than opinion) from time to time it might be along your line ? !